Dironet® 200 tablets - blisters of 10 tablets. Outer package: carton. The widest range of anthelmintic action. Convenient dosage for animals with different body weight. Dironet® 200 for dogs of small breeds and puppies, contains in one biconvex pyrantel tablet pamoat 60 mg, praziquantel 20 mg and ivermectin 0, 024 mg. Dose - 1 tablet per 4 kg of body weight of the animal. 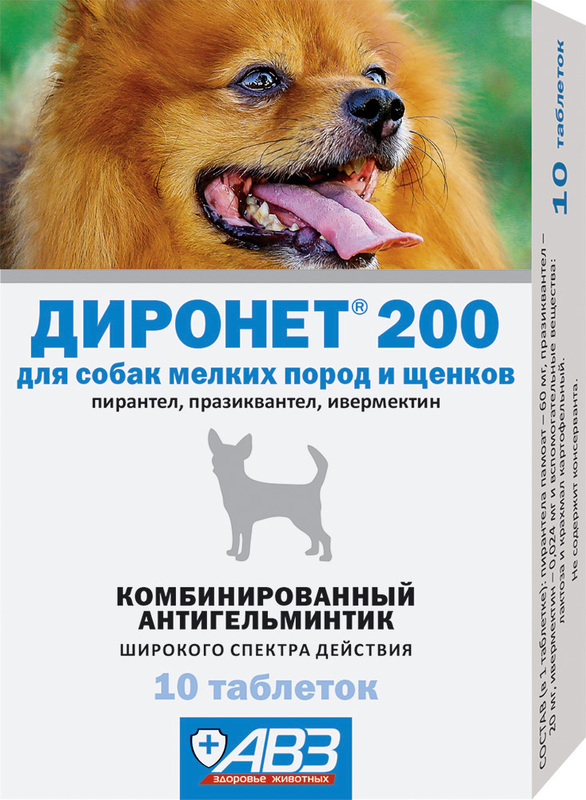 Dironet® 200 has a broad spectrum of nematodocidal and cestocidal effects, and is active against round and ribbon helminths parasitic in dogs and cats, including Toxocara canis, T. cati, Toxascaris leonina, Uncinaria stenocephala, Ancylostoma, chyne, chytophyschisis, chytosephala, Ignacaris leonina, Uncinaria stenocephala, Ancylostoma, chytophyscaris leonina. granulosus, E. multilocularis, Diphyllobothrium latum, Dipylidium caninum, Multiceps multiceps, Taenia spp., as well as the larval development phases (microfilariae) of Dirofilaria immitis and Dirofilaria repens. The mechanism of action of ivermectin is to bind to glutamate-dependent chlorine channels, located mainly in the swallowing and somatic muscles. As a result, the membrane permeability to chlorine ions increases, the transmission of the neuromuscular impulse is blocked, paralysis and parasite death occur. The mechanism of action of pyrantel pamoat is to block the neuromuscular transmission, impair the permeability of cell membranes and inhibit cholinesterase, which also leads to paralysis and death of the parasite. The mechanism of action of praziquantel is based on impaired glucose transport and microtubule function in cestodes, inhibition of fumarate reductase activity and ATP synthesis, increased permeability of cell membranes and impaired muscle innervation. Prevention of dirofilariasis, as well as treatment and prevention of canine nematodoses and cestodoses. Do not use the drug to females during pregnancy and lactation, as well as puppies and kittens younger than 3 weeks of age. Do not use the drug in animals weighing less than 0.5 kg. For dogs that are sensitive to macrocyclic lactones of breeds, including bobtail, collie, sheltie and their mixtures, the drug is used for its intended purpose and under the supervision of a veterinarian. Doses and order of use. With cestodoses and nematodoses of the gastrointestinal tract, Dironet® 200, with therapeutic and prophylactic purposes, is used individually orally once a day in the following doses: pyrantel pamoat - 15 mg / kg, praziquantel - 5 mg / kg, ivermectin - 0.006 mg / kg, of calculating 1 tablet of Dironet® 200 per 4 kg of the mass of small breed dogs and puppies. With the preventive purpose deworming is carried out quarterly, as well as before each vaccination. To reduce the number of microfilariae circulating in the blood of animals invaded by D. immitis or D. repens, the drug is prescribed in a therapeutic dose once, once a month. In order to prevent dirofilariasis in a region unfavorable for the disease, Dironet® 200 is used in the spring-summer-autumn period: once before the beginning of the summer of mosquitoes (March-April), then monthly from April to October, and the last time in a season 1 month after the end mosquito summer (October-November). When using the drug according to the instructions, side effects and complications are not observed. Dironet® 200 tablets are stored in sealed packaging of the manufacturer, in a place protected from light and moisture, separately from food and feed, at temperatures from 0 ° C to 25 ° C, inaccessible to children and animals.